My produce market stocks all their varieties of peas in one spot. Looking over the selection, I thought it would be fun to do a vegetable dish with three types of peas. I picked up some snow peas, english peas and snap peas. I shelled the english peas, then blanched each variety separately. You could skip the blanching if you’re in a hurry, I just like the way it preserves the color and ensures a perfectly cooked end product. I decided to cook the peas with some leeks and bacon. I mean really, who doesn’t like bacon in their vegetables? Even with the small amount of bacon, this is a fairly healthy dish, and it was fun to taste the differences in the pea varieties. Bring a pot of salted water to a boil. Blanch the snap peas for about 1-2 minutes, or until just tender. Transfer to an ice bath. Repeat the process with the snow peas and english peas. Pat dry with a paper towel. Heat a large pan over medium, then add the bacon. Cook until the bacon is crisp and browned. Remove the bacon from the pan, drain on a paper towel. Discard most of the bacon fat from the pan until you’re left with a few teaspoons. Place the leek in the pan, season with salt and pepper and saute until the leek is tender and slightly browned, about 3-4 minutes. Add all the peas to the pan, toss to coat with the leek mixture. Cook until the peas are warmed through, season with salt and pepper. Sprinkle the reserved bacon over the top and serve. My favorite are snow peas! I also love blanching and the way it keeps the color so perfectly green. I love bacon with vegetables, it adds so much flavour. yumyum! yummy! <3 bacon fat. what a great, simple veggie side. Thanks for sharing another great veggie recipe! Absolutely love this dish. 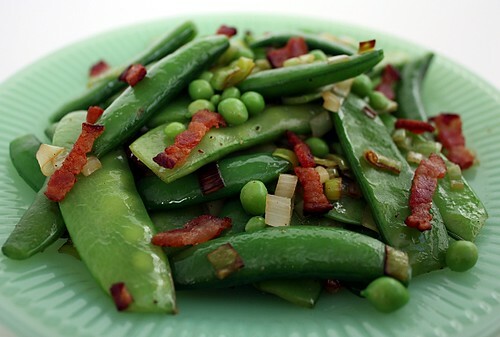 Peas and bacon are one of my favorite combinations! This looks wonderful and so simple! Gorgeous pictures. They look beautiful...with and without the bacon! Looks delicious - I love peas and the addition of bacon just makes it that much better. Wow that looks awesome! It's too early where I am to get fresh peas at the Farmers Market, but I will remember this recipe when they come in season. I wish we had a farmers market. This is one gorgeous photo. Those are bright and beautiful peas! Sounds fantastic. I'm not fond of "peas" but that has me rethinking my position on them. That looks absolutely awesome. I am keeping this handy for when the farmer's market gears up. I do have peas and beans of my own in the garden too...but it will be a longggg while! Bacon makes everything better! I love peas...all kinds. This is a great recipe. thanks for sharing. Beautiful vibrant green color, and who doesn't love a little bacon? I love all kinds of peas, so I know I would love this! Great idea with the bacon, you can't go wrong! I want your Farmer's Market! I love the combo - love all sort of peas. And the addition of bacon and leeks makes it all so tasty. I am beefing up my vegetable eating while all is fresh. Thanks for the recipe. What a tasty way to use peas! Funny, I actually worked with these same ingredients in a risotto dish I made this weekend! Except I only used one variety of peas. Looks really fresh and delicious! what a pretty dish....I could eat a pound of this! I love how simple this recipe is. I bet the flavors are really outstanding together. I love your use of simple and fresh ingredients to make a delicious dish. The colors are just amazing as well. I love this. Peas are pretty good, but bacon makes it better! Looks like a nice way to eat your greens! Sweet peas! What a great idea. And the bacon is an added bonus-how delicious! This is another beautiful, healthy looking veggie dish and I love that you put bacon in it! Yum! Wow, three kinds of peas! So yummy with bacon! What a nice combination of the peas with lardons. Beautiful. Oh what a great idea. Those peas with bacon and leeks look wonderful. What a grand idea Sara looks perfect. This is so fresh looking and sounding! I am so drooling right now. Looks so delicious! And you're right: everything is better with bacon! This looks fantastic. I just happen to have snow peas and regular peas to use up. Thanks for the recipe. Peas are just coming into our farmer's market and I especially the touch of bacon to accent the flavors and textures of the peas. Lovely dish. I bet the bacon adds a lot of flavor...and salty goodness! YUM! Sara this dish screams Spring time to me. Looks so green and lovely! I never knew there was more than one pea! That looks like it taste fabulous..thanks for sharing. This sounds really yummy, and with all the heavy things I ate this past weekend, it sounds very light and healthy. That looks so amazing! And your photography too! Simple and perfect. Love it. I like bacon in ANYTHING!!!! Love all 3 types of peas! Yum--I love peas. Such a pretty dish too! Peas are ~almost~ here in the NYC Greenmarkets. Can't wait! The old-fashioned have-to-shell-them English peas are my favorite. This year I'm going to try and freeze some. Everybody in this thread is talking about the bacon as if it's a naughty indulgence. Well, fear not, Bon Appetit has gone on record to say that bacon is, yes, healthy! (http://bit.ly/hlw6m). We've truly gone through the looking glass. And really how can something that delicious not be at least a little bit good for you, right? beautiful picture, beautiful idea. I will have to try it out with my farmer's market goods next week. Thank you for posting. I just cut out a recipe from our Montreal Gazette yesterday w/ these 3 peas:) Yours look delicious!! 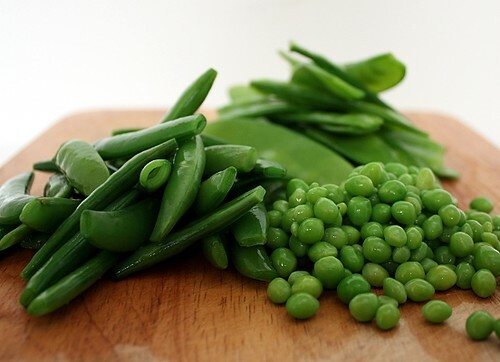 The snap and sugar peas are on my list..so fresh and crunchy looking! so fresh and springy! I love that jadite fire plate in the second picture...pretty! What a nice simple and tasty dish. That sweet and salty combo is a good one. vat a healthy yummy dish.. love peas very much and i love the idea you have used.